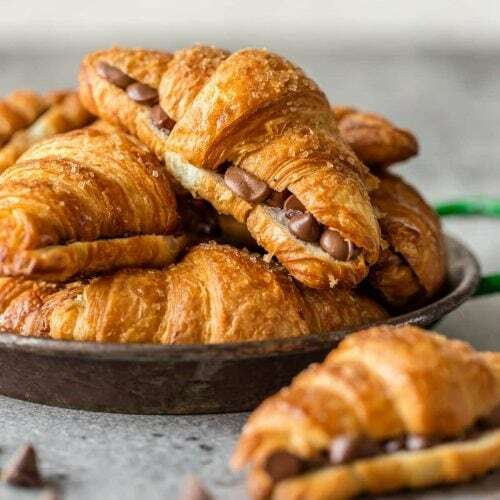 This SHEET PAN CHOCOLATE CROISSANT RECIPE is our favorite way to make a sweet breakfast for a crowd! Such a fun and easy breakfast pastry baked right in your oven. Preheat oven to 425 degrees F and line a cooking sheet with foil or parchment. Place an oven rack on the lowest level. Place each croissant on the cooking sheet and liberally sprinkle the inside of each with chocolate chips. Very lightly sprinkle the inside with coarse salt or sea salt flakes. Close the top of each croissant and lightly brush the tops with maple syrup then sprinkle them with coarse or raw sugar. Place the baking sheet in the oven on the lowest rack and bake for 4-5 minutes or until the tops are golden brown and have caramelized. Watch the croissants closely beginning at 4 minutes. They can burn quickly at this point. Transfer the croissants to a cooling rack and cool for 1 minute. Remove them from the tray to cool. These are delicious warm or cold.